Wow, it has been a long time since I posted a blog. 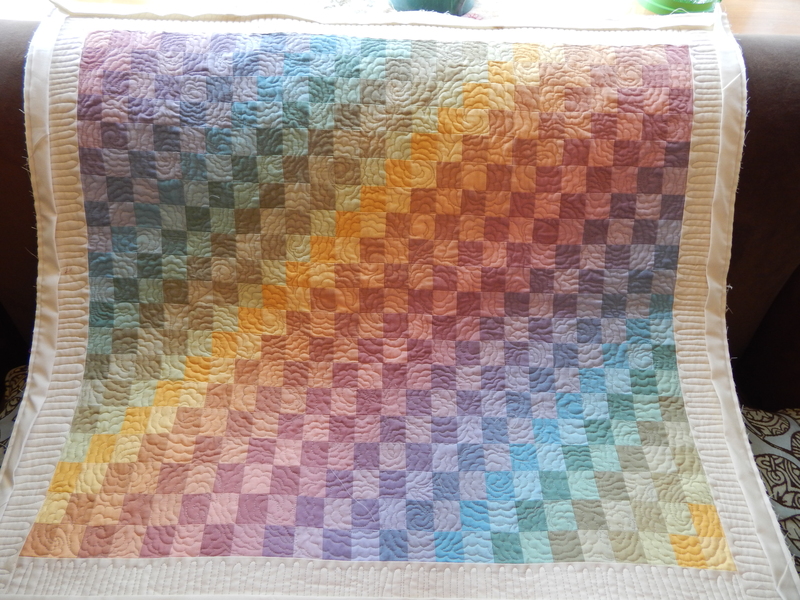 It wasn’t intentional and it wasn’t caused by any unpleasantness in my life; as a matter of fact life has been good and I am lucky to be able to share my passion of quilting with you. Even if you don’t love quilting and you read this, I hope you are passionate about something in your life and you can share the feelings that I encounter in my updates of my hobby. Just a few notes for catching up on the personal side. I am excited to say that I have given my workplace notice that I will be retiring on September 9th. I have worked all of my life and I am looking forward to spending more time in my home, being a housewife, quilter and who knows what else will come my way. Both of my sisters are retired and what fun it could be to get together occasionally for lunch, or a cooking class, or a little wine tasting. On the quilting side, I am no longer in charge of Program for our local quilt guild, I am now co-chair of our annual retreat in Ivoryton, CT which will be at the end of May. I will share updates on this as items come along. 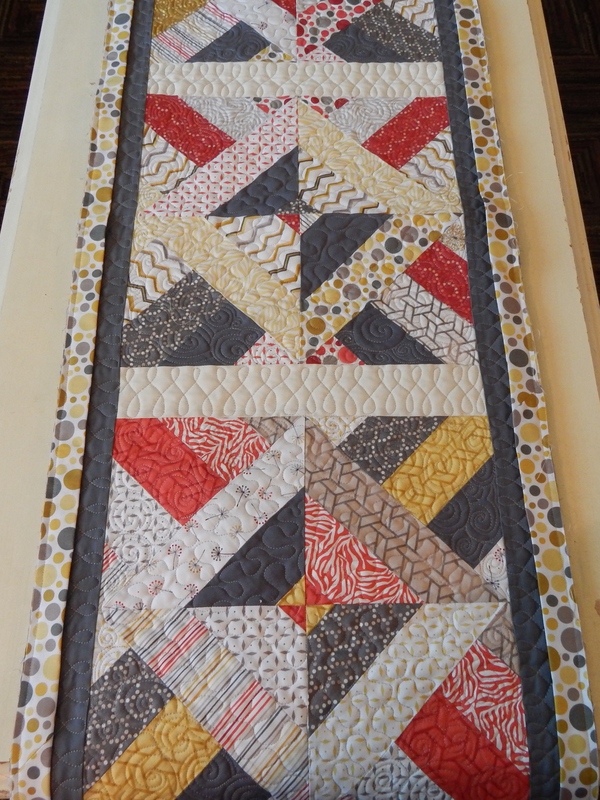 The recommended quilt for Retreat 2016: I used a jelly roll to make this quilt but we are also encouraging people to make it from scraps that they have. A few years ago I made some take 5 blocks from some Jane Sassaman fabric that I loved the colors of. Once I made the blocks, I didn’t like them, too much color, so I put them away. Recently I took them out and decided to try to make them more palatable by adding white sashing to break them up, so I sliced and diced them and added the white. 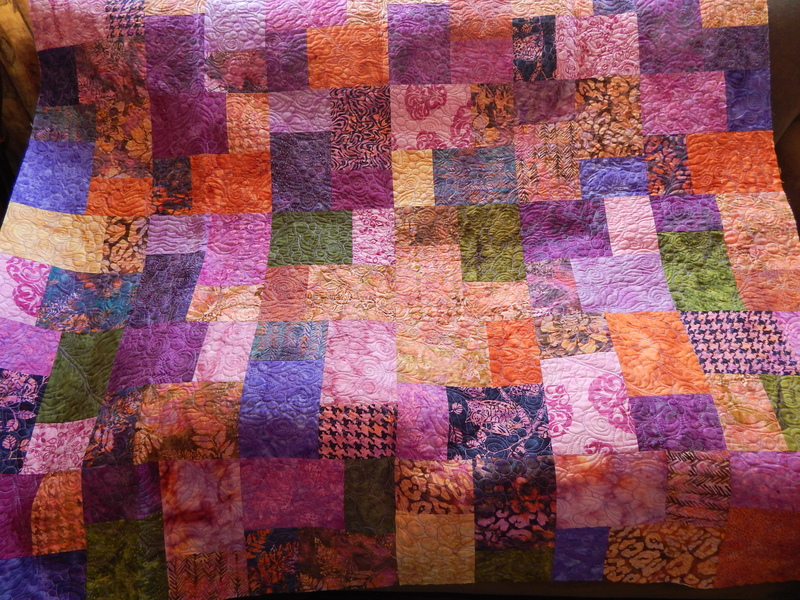 I was able to finish the blocks into a quilt and quilt it, someone will love it. 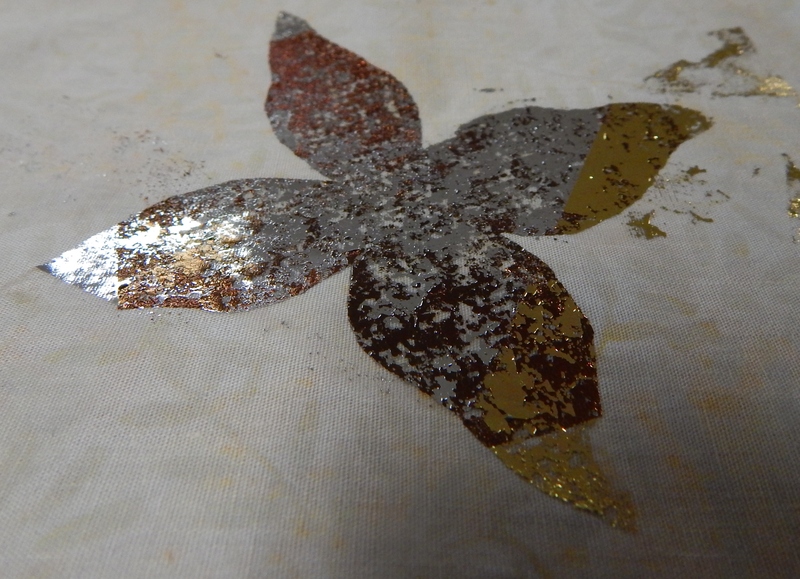 The last item for now is something that I am just finishing up for someone special, here is a small piece. This is last years “before” picture because I haven’t been there yet today. It is a family affair for us. 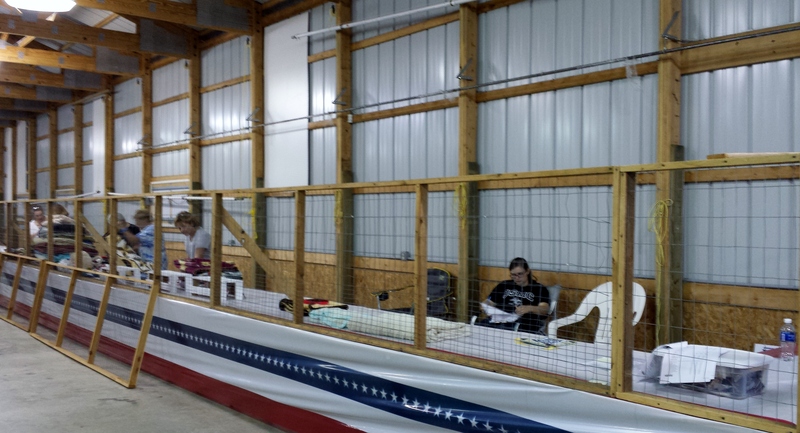 My husband belongs to the Lion’s Club that puts this event on every year and my daughter Rebecca (https://rebeccabookreview.wordpress.com/) is also a Lion so she will help in our Needlework section tonight and occasionally over the weekend as her other duties permit. You can see her reading one of her many books here as she was waiting for entries to come in last year. Well I better get started on my day! Last time I was making mug rugs to relieve some stress one evening after work, and that made me think about things I could work on during the week after work when I had smaller units of time. I also have been hankering to play with some Halloween fabric which I think is loads of fun to play with and I seem to have collected (hoarded) quite a bit in my stash. 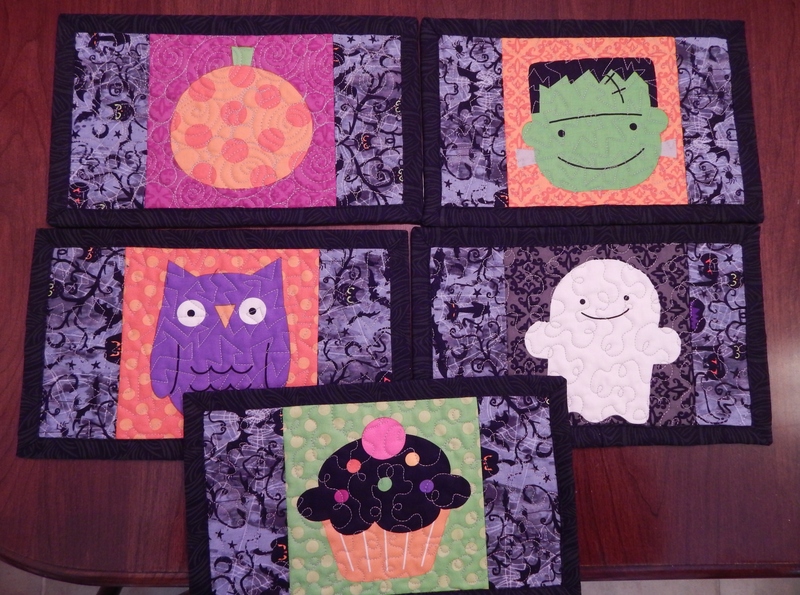 Halloween panels are so cute, my daughter even buys them for me but then, what to do with them. I find it is fun to use pictures from the panels to make place mats. 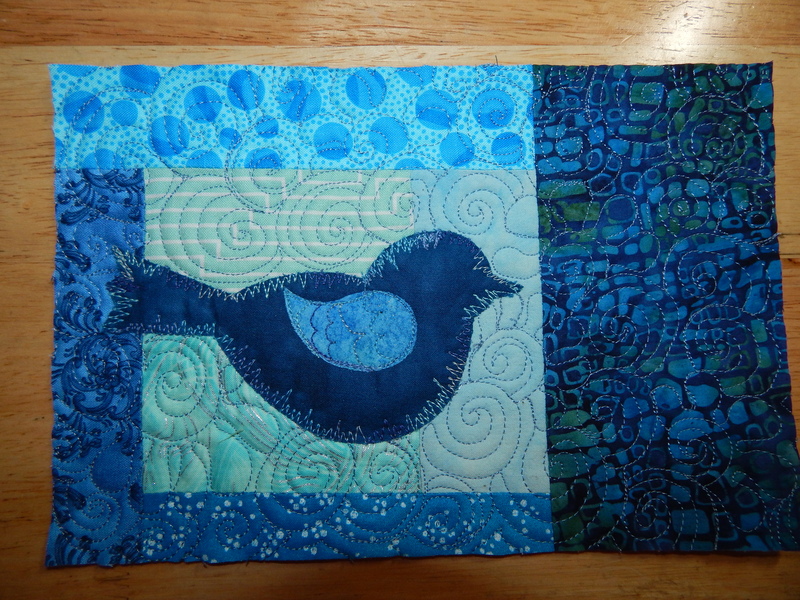 Cut out your pictures, put some borders on, do some fun quilting and machine bind them. I used the smaller pictures for more mug rugs!! If you haven’t done machine binding yet, this is the perfect time to do so. 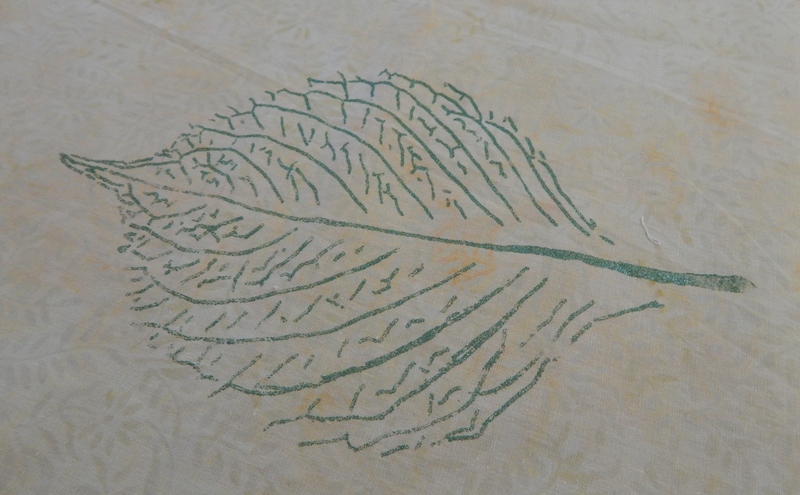 The place mats make lovely gifts and hand sewing the back of the bindings on 4 place mats takes quilt a bit of time, so if you can machine bind them all you get more gifts for more people. I participated in a pay it forward by 5 challenge on Facebook this year and the 1st four place mats have already been delivered to my niece Jessica, for her family as part of that promise to do something for 5 people this year. Here is a pair that I will enter in the fair and here are the mug rugs that also came from the panel. More finishing up before the fair includes a table runner that was made from leftover blocks from a modern jelly roll quilt that was made last fall. I did not do that binding all by machine, so I still have to finish the hand sewing part. This will be a busy month with the fair coming on August 28th, so I will have to make use of those smaller periods of time in the evening after work, and it will help to reduce stress at the same time. This week has been intense at work and my stress level has been up so Wednesday night I decided to try to level out by doing some evening sewing. I took a couple of leftover blocks and some leftover fused fabric and put together a couple of mug rugs. Now I just have to bind them. Going into my sewing room and playing with some leftovers without any standards to uphold is so relaxing! It also kept me from using food to deal with my stress which is a whole other story. Anyway it was fun to play, and I am sure that my daughter, https://rebeccabookreview.wordpress.com will pick one out as soon as she sees the pictures! I know of a home for the other one! The last two years I have been co-chair of program for our BBT Quilt Guild with my friend Debbie Denslow. We seem to be a good fit in anything we do together, our minds never stop brainstorming and when she suggested that we volunteer for the position together, I did not hesitate to agree. Next Friday is our last meeting for our 2 year term and I have mixed feelings about it. For anyone who is in an organization, don’t be afraid to volunteer to be on the board, or take a position of leadership. I will admit, that it is a bit of extra work, but you wouldn’t be in the organization if you didn’t love it and you have a chance to meet new people that love the same things you do. I have met some very interesting teachers, speakers, and people just enjoying the classes that we have scheduled and I would have missed it all if I had not volunteered. It is not that we are going away, Debbie has of course talked me into a new challenge….. we are going to be in charge of planning our annual retreat for the next 2 years! I can’t wait to see what I learn from this experience. Since I last wrote, my family rented a condo in Newport, RI and we spent some time together. It did not include any sewing but I did have a chance to go out with the camera for some photos of beautiful inspiring coastline area. We had a wonderful time together, it was very relaxing and we got home just in time for my husband to pack for Maine and leave me to 4 days of home alone sewing and planning projects for retreat. Also this year I had been given blocks and unfinished projects from a woman who was no longer able to quilt, it was quite an extensive pile. I brought all the blocks and projects home, washed them, picked a few pieces out for myself and packed the rest for retreat. Last Friday, off we went to retreat! We are usually given a pattern just in advance of a suggested project. I put the top together while I was home alone Memorial Day Weekend, so I brought it to quilt. 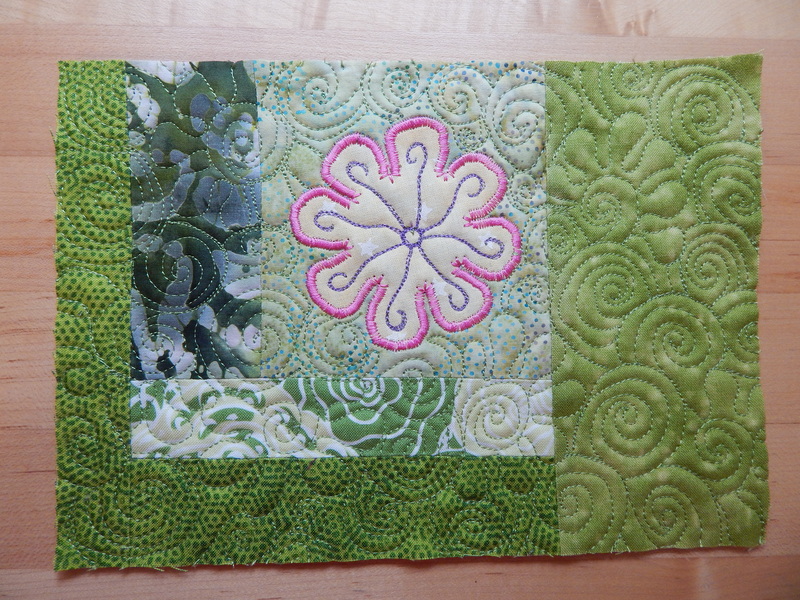 I also quilted one of the pieces that I had been given and finally I put together a table runner and backing from some extra blocks that I had from a quilt last year. The time spent with my fellow quilters and one reader (https://rebeccabookreview.wordpress.com) was inspiring. So much color, so much laughter, so much fun! 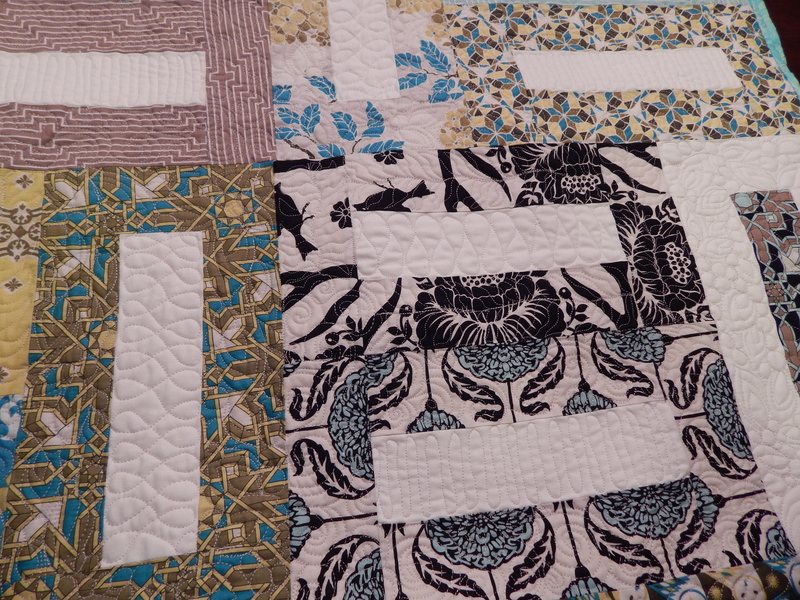 The blocks and unfinished projects that I had been given were put on our share table and adopted by other quilters. One of the women in our group, Cindy Guendert, took an unfinished project from the table and made her quilt top around it. 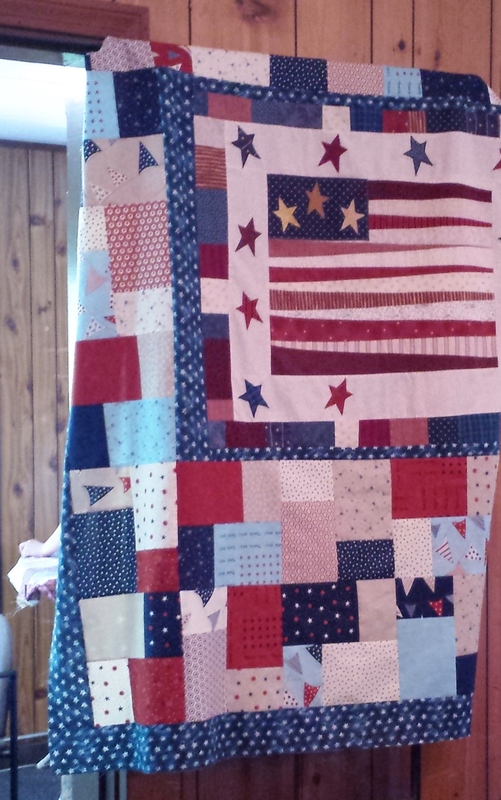 After it is quilted it will be given to a Veteran as part of the Quilts of Valor project that she participates in. Wonderful! My daughter Rebecca (the reader) and I went for a short walk each day to keep the circulation in my legs moving and she provided great conversation and support also. It helps to have a younger, stronger person when moving all the equipment in and out, she is always so kind to me. She didn’t get as much reading done as she thought she would and I didn’t get as much sewing done as I thought I would, so I guess we spent too much time talking, laughing and visiting! Overall, we would both consider it to have been a successful weekend. So now my focus will be put toward making retreat for the next 2 years as much fun as it has been in the past and more fun, if that is at all possible! Don’t be afraid to get involved in the activities you love, the rewards are endless. 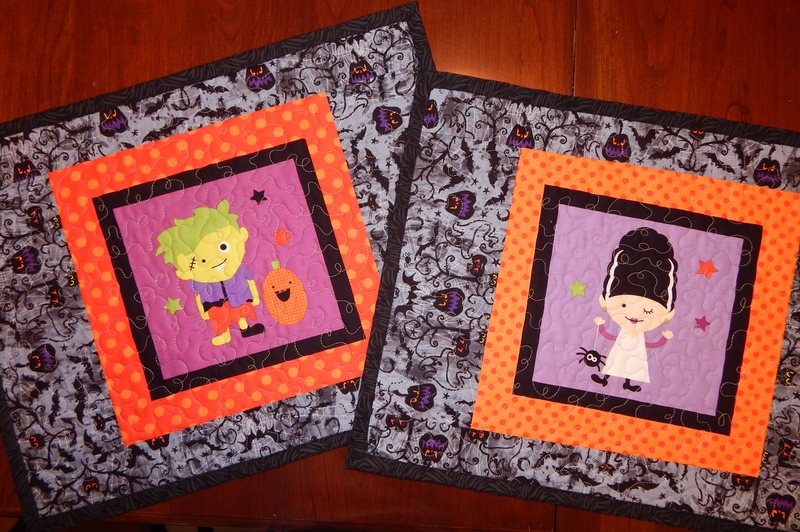 This is one of my favorite times of the year for quilting! I know many of you use the cold winter months to get more of your quilting done, but for a couple of reasons this is my time. 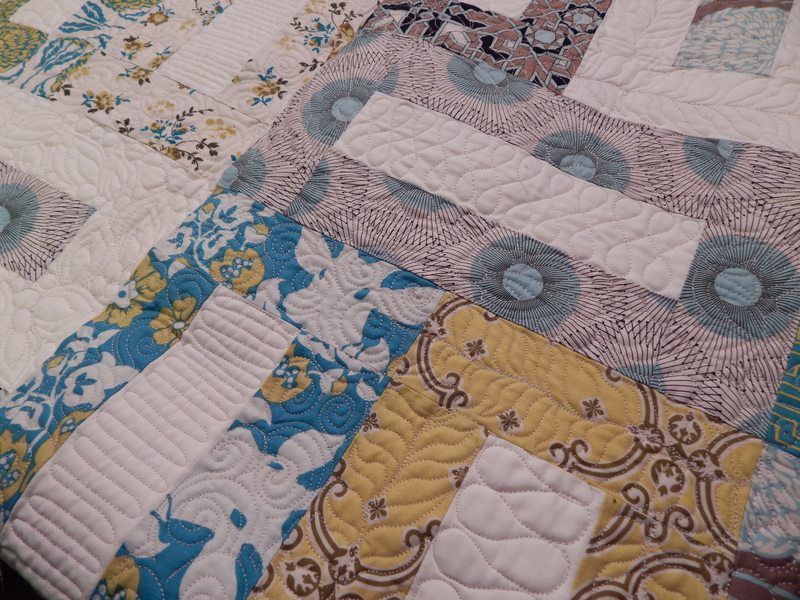 Our quilt guild retreat is coming up starting May 28th. We pack all of our tools, sewing machines, tables, cutting boards, and a little wine and we head out into nature to spend 3 days sewing and spending time with the nicest women. They are all just so happy to be there, there is not a complaint to be heard. Smiles and laughter all around. My daughter, Rebecca will be coming along again this year and if you have read my blog, she is not a quilter, but she reads in her spare time. Her job is intense, so it is her weekend to get of the stress and read, read, and read. You can check out her blog here : https://rebeccabookreview.wordpress.com. This is a picture from last year, so peaceful. Before we head out for that wonderful weekend, I also have Memorial Day weekend coming up. The thing about that weekend is that my husband goes to Maine with his brothers and his Dad and they do repairs to a cottage they have, and get it ready for the season. He will be leaving Friday morning so I will be alone to cut fabric, quilt, or get projects ready for retreat. He will be back Monday night, so I have 4 days to work on projects! I am looking forward to that weekend also. 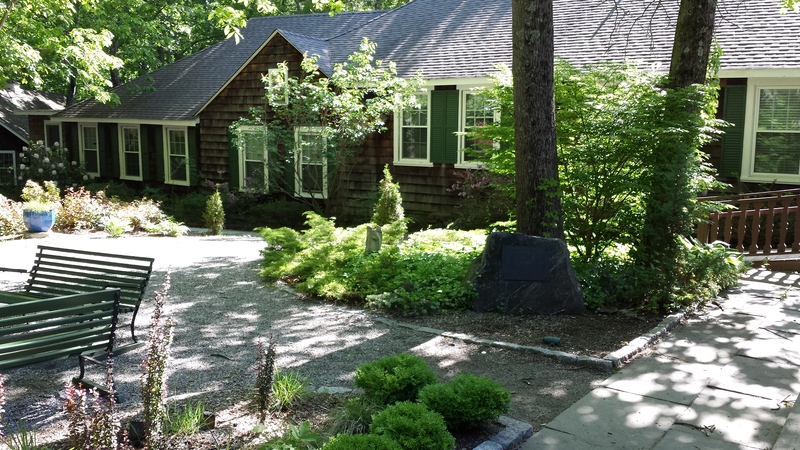 Outside of quilting, I had the pleasure of a visit to Cape Cod. My cousin lives there and she has been trying to put together a girl cousin weekend for sometime. Most of our schedules finally aligned so my sister, another cousin and I drove up for the weekend for a visit. Donna and her husband were so gracious to us and Donna tried to make sure each of us had something that we wanted to do, happen. My wish was a stop at the local quilt shop. We visited Tumbleweed Quilt Shop in West Barnstable and it was large and beautiful. So many wonderful fabrics! I could only buy a couple because my stash is already too large to manage. 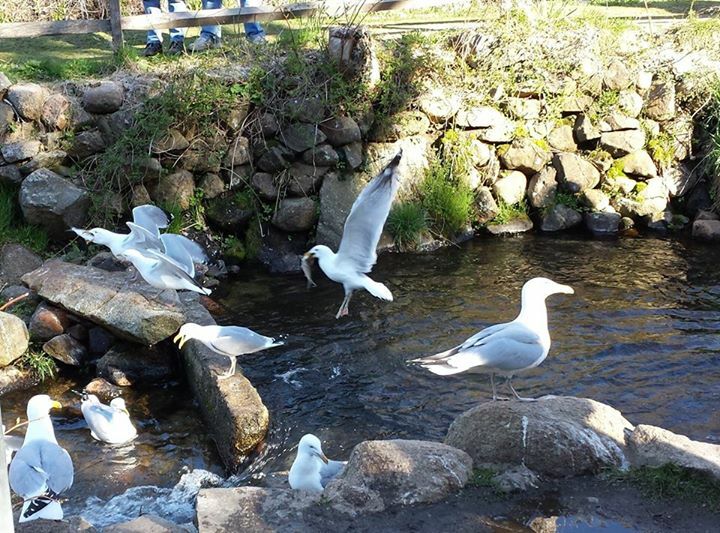 One of our other stops was to watch an annual event of the herring swimming upstream and seagulls making meals of them, snatching them out of the water and swallowing them whole. It was like a scene out of the birds! I caught a photo with 2 seagulls with herring in their mouths. Yikes! One of the wonderful blessings that I have been given is the thirst to learn more. I am not sure if it is a genetic trait, or if it was passed on to me by example or both, but I love to expand my knowledge about what I happen to be interested in. 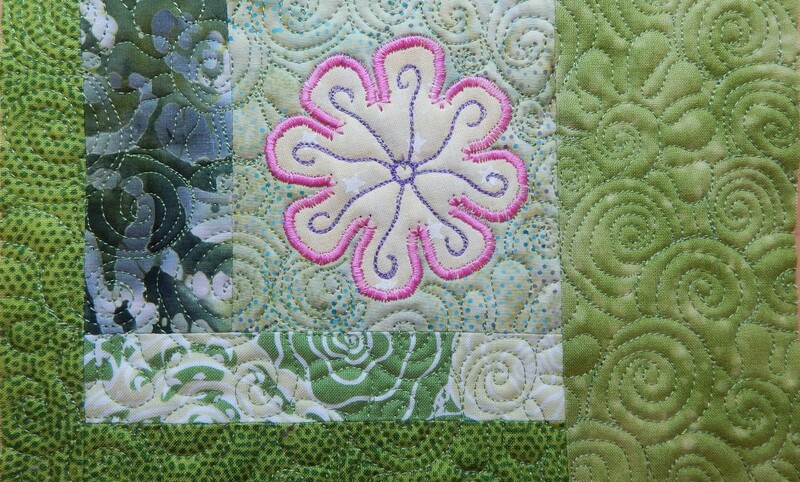 Of course now my interest (passion) is quilting. Yesterday our guild presented a class in Surface Design techniques for cloth and quilting and it was so inspiring to work with others, learn and try different ways of changing cloth to suit your purpose of making art. I can open up a whole discussion about the term of making art, and I consider it to be making art, when the finished project is a completely original project. My Dad always said that you cannot claim yourself to be an Artist, but the world deems who is an Artist, but I do consider some of the work I do to be making art, even if it isn’t good enough to be rallied by the world to make me an Artist. It is the act of creating something that comes from within you, that you feel is successful; it gives great joy! 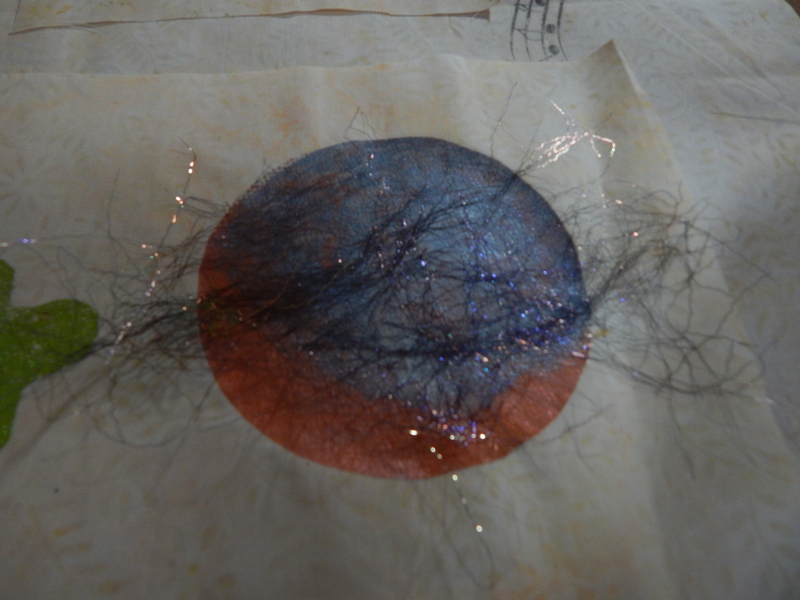 Our Teachers were Melanie Johnston and Joan Blade Johnson, and we used foils, paints, and angelina fibers with glues and different fusibles. There were no finished projects, but there were wonderful seeds planted in the creative side of our brains for use someday in the future! It was playtime for adults and of course, as it always happens in gatherings of the women in our guild, there was lots of sharing and helping. Don’t ever stop expanding your horizons!